JIMMY Osmond is especially well known to theatre audiences in Northampton after his performance as Buttons in Cinderella at the Royal & Derngate in 2008, and he is to return with his brothers later this month for a show billed as The Osmonds’ Final UK Tour. 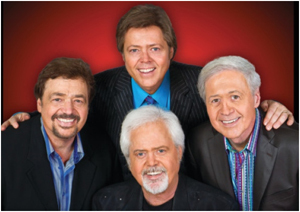 1 Why have you decided that this is the final Osmonds’ UK tour? Not to mislead anybody, we are a family and we will never disband, but this will be the final one of this line-up of brothers. Merrill is headed in a different direction, he has been for a while, so we decided let’s do one last tour. I’m sure we will always do something together but as far as a proper tour goes, this is it. 2 You are playing some smaller venues on this tour, why did you decide to do this? We wanted to play the smaller venues and go round the whole country. It means we can change the show, rather than have a pre-determined set and do everything from barbershop to country. You can be much more interactive with an audience than when you play an arena. 3 What are the best and worst things about working with your family? It’s the best and the worst. We love each other so much and we have faced a lot of changes, you know each other so well. You can’t just tell your brother forget it, you have to work things out and we have learned to agree to disagree on things. My brothers are my best friends and we always have fun, but it’s more about the little day-to-day experiences that happen on stage or on tour. We have a saying “tragedy plus time equals humour” and it’s really true. 4 You are doing 50 dates on your tour, how do you cope with this gruelling schedule? We grew up working hard. We haven’t done less than 50 to 100 shows a year as long as I can remember. We love what we do, you can’t fake it for this long. 5 What keeps you so positive and cheerful? I have my moments. But I have a lot to be happy about. The things that really matter to me are my family. Life is good, if I never performed again I would still feel I had more than my share as far as opportunities go. Being happy is a decision, if you decide to be happy and grateful you enjoy your life more. 6 What did you think of the Northampton audiences when you were performing here in panto in 2008? I love Northampton. But all over the country it’s really been amazing. People have just really stayed loyal. 7 Which is better, fame and performing now, or when you were first in the public eye? The 70s were pretty amazing, I like it now but I find myself missing some of those days when we were all together. The best time was the late 70s from a career standpoint. 8 What advice would you give to young performers today? 9 How do you like to spend your time when not working? I’m always working. But as for hobbies I like watercolours and cartooning. 10 What book did you last read? I’m not much of a reader but I buy lots of books, I’m reading a book about Steve Jobs and I read the Bible every night. 11 What meal do you most like to cook at home? 12 What is your proudest achievement? Being a dad. I really found when my daughter was born, Sophia, it wasn’t about me any more. It was so cool. I have had such a great time full of wonderful experiences, but now I’m concerned what am I going to do to help them. 13 What is your worst habit? Eating late. Ice cream. It’s kind of naughty. 14 What are your pet hates? I was on the train the other day and there was an elderly couple sitting next to me and a family with young kids and these young kids came on and they were foul mouthed, every other word was an F. Totally inappropriate. It’s disrespectful, it kind of bugs me. 15 What do you drive? An S4 Porsche. I used to be crazy about cars but to be honest with you the car I probably like best is my Ford F10 pick-up truck, it’s such fun. 16 What is your most treasured possession? If I had to run out of the house and only get one thing, other than my family, it would probably be my wedding ring, and I’m not just saying that to score points with the missus. My wife sold her car to buy it. 17 What has been your best moment? There have been a lot of really cool moments, but I really liked being in Chicago because it was grown up. I had a lot of hits as a little kid and people tend to pigeon-hole you but the producers of that took a risk on me and they changed the script to accommodate me. I couldn’t believe it, that was fun, for me that was kind of a big moment. 18 What has been your worst moment? Perhaps when I lost my mum and my dad, I have got faith, I believe we will see each other again. 19 What makes you laugh? I’m a little bit cheeky, I shouldn’t be. I like British humour, I like the old ones... Benny Hill and Mr Bean. I don’t like it when it gets dirty, but I like it when it gets clever. 20 Who has most inspired you in your life? My mum, she was a theologian, she studied all kinds of religious beliefs and she was accepting of people, never judgmental. She had a way about her that was amazing.